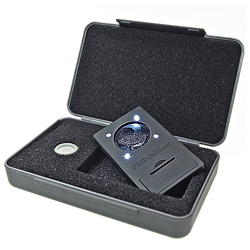 The mini Quasar® Sensor Loupe® is the latest edition of inspection devices from Visibledust. Mini Quasar® is based on award winning Sensor Loupe® technology comes in pocket-able format and flat shape. While many imitation low quality products are made simply with plastic lenses, the mini Quasar® is made of highest quality of optical glass with fluorine coated surface for the sharpest image possible. 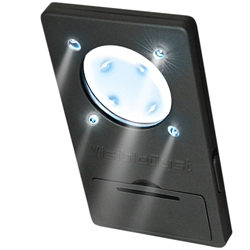 VisibleDust 7X mini Quasar® is equipped with 4 SUPER bright LED lights positioned at angles to identify the smallest object on the sensor surface (usually impossible to be seen otherwise). Regular LED light when shinned at the sensor penetrates different layers of filters to produce useless checkered shape visual images of various filter depth without focusing on sensor surface itself. By using Quasar® Sensor Loupe® inspection devices from visibledust one can eliminate these problems. Using inspection devices from visibledust will reduce the damage to sensor by excessive cleaning hence, saving the cost associated with sensor cleaning. The mini Qusar® requires two (2) CR2032 lithium batteries included. The mini Quasar® comes with a soft coated foam black box to protect the device.